KANSAS CITY, Mo. (AP) — The Kansas City Chiefs walked out of Memorial Coliseum in Los Angeles late Monday night confident that they could beat the Rams if they should get a rematch in the Super Bowl. For all the positives the Chiefs did during their 54-51 shootout loss to the Rams — and there were plenty — the glaring mistakes overshadowed them. Patrick Mahomes tossed a trio of interceptions, lost a pair of fumbles and was sacked three times. The defense gave up too many big plays. Harrison Butker missed an extra point. And the Chiefs were penalized 13 times for 135 yards. The Chiefs (9-2) had done that most of the season. They only had eight turnovers over their first 10 games, and while penalties have been a constant problem, they had been able to overcome them. “You go back in a game like this, heck, I wish I would have called some different plays. We can all do better,” Chiefs coach Andy Reid said. But perhaps the most important fact is that Kansas City’s two losses have come on the road against powerhouses in the Rams and Patriots, the Chiefs remain on top of the AFC West and have the No. 1 seed in the playoffs still firmly in their sights. “You wanted to go win that game going into the bye week against a good team like that, a playoff team. 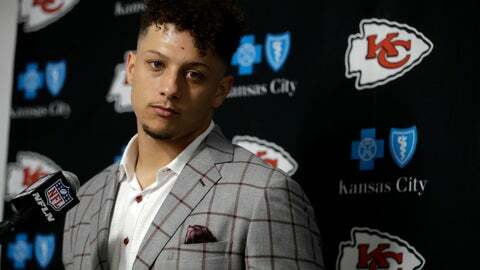 But at the same time we still control our own destiny,” Mahomes said.